The American leisure marine industry is not the power house it once was, but one boat builder has thrived and dominates the manufacturing of fishing boats: over 2,000 a year - Robalo. Their products are a long way from the cheap and cheerful boats that gave American imports of the past a mixed reputation. The 10 year hull warranty suggests quality. Helping durability along, all Robalos feature vinylester resin and bottoms reinforced with Kevlar. 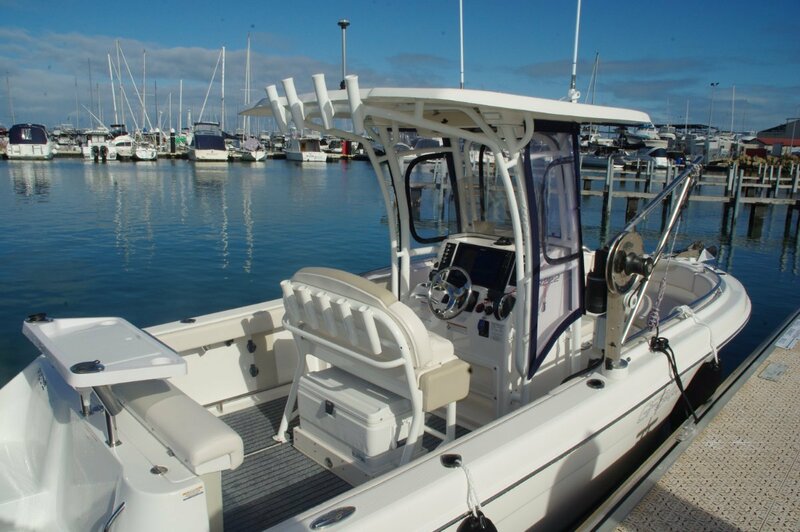 The Robalo R222 centre console has secured itself a local niche: with length a smidge under the magic 6.75 metres it qualifies for rafting up on the Rottnest moorings. The tendering role (some people do not like the more usual RIBs) is why most of these Robalos live in racks and why the agents quote them without trailers. The odd owner, though, has a dual role: tender to the mother ship in summer, fishing up north in winter. Our Robalo featured any number of custom features created by the agents to suit the buyer. Like other American builders, Robalo see anchoring as a remote possibility accommodated by a cleat. This has been replaced by a bowsprit, windlass and cable locker. Driver protection has been improved by a powerfully framed support for a GRP hardtop, and equipped with clears. The folding lounge at the transom is mounted on the top hinged door of a compartment housing a lot of technical stuff. Here without fumbling you can locate the dual batteries, filters, switches and all the rest. Doors and lids feature largely throughout the 222. Practically every accessory has its own compartment; all vacant space between hull and deck gets used to store something. Small lids dispense with gas struts using instead brass friction pads; something less to fail. Beyond a certain size of boat the console is big enough to house a toilet, which the 222 has. It also has space to act as a change room with full standing height; a capability that will be widely loved. Despite its bulk the console left enough room for easy movement fore and aft beside it. 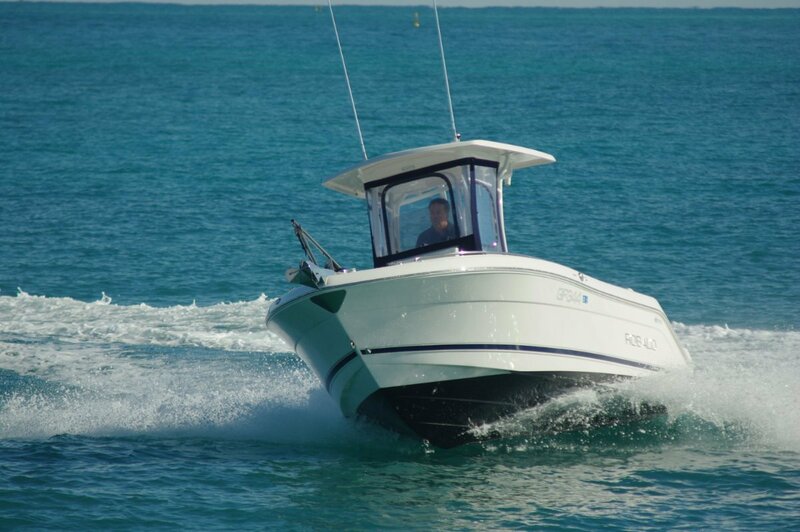 For the tender or picnic tasks the 222 satisfies the prime requirement of lots of places to sit. 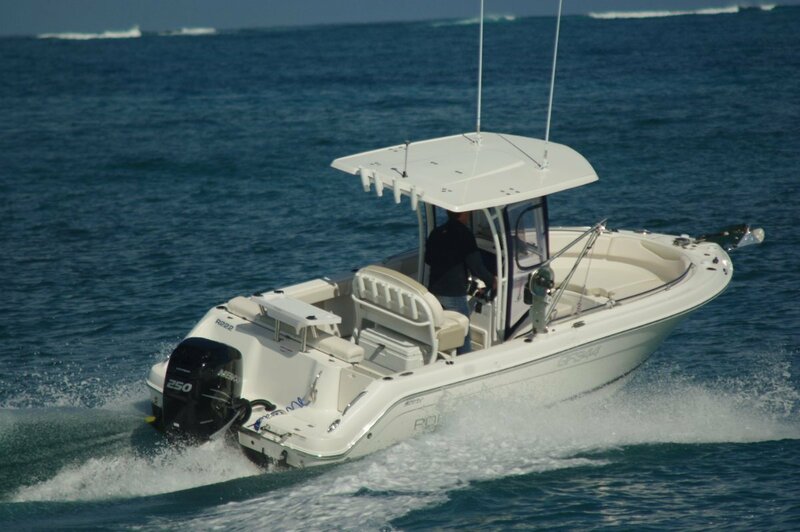 Aside from the double helm seat, its frame bridging a tailor-made esky, another pair can sit in front of the console and four or more at each end of the boat. All those seats should have a long life: the vinyl felt like beefy stuff that I was informed was four times thicker than standard. Under the forward seats and the deck in their vicinity the compartments are insulated. There is capacity here for vast amounts of food and drinks or, on other occasions, fish. The latter was probably more in the designer’s mind because he was primarily creating a fishing boat. Certainly, the buyer of this one has a parallel role to that of tender in mind. In the starboard coaming the agent mounted a pot hauler, and not the usual winch and tipper arrangement. This one is a version of the kind used on South Australian commercial cray boats. Incorporating a mini crane, it takes up no inboard space and does little harm to the aesthetics. Other additions to the fishing kit are a drop-in bait board aft of the settee and a huge combo sounder-plotter. Builder-supplied accessories include toe rails, rod sockets in the coaming and helm seat back, and pop up cleats. Standard power is 200hp of whatever make of outboard you choose. The owner opted for a Mercury Verado 250. 200 would deliver good all round performance, but 250 will probably be useful with a full load. With our light load it sparkled. The gentle conditions let us perform all the manoeuvres at the same time as all the throttle movement. It was a pleasure to drive. It also performed well when stopped, demonstrating excellent stability despite a sharp 21 degree deadrise. The review boat will be featured at the Perth Boat Show alongside several other Robalos.